I came late to Led Zeppelin and it wasn’t until my early twenties that I really started to appreciate them. I can’t really say why that was. It wasn’t as if I wasn’t exposed to the likes of Stairway to Heaven on the radio or various other tracks at the likes of the Mayfair. I bought a copy of IV, but only because it was purple vinyl and cost all of 50p from Mickey who drove the local general dealers van around the streets of Wallsend. It didn’t come with an LP sleeve for that price mind and it rarely hit the record deck. For some reason they just didn’t click with me. I equally can’t put my finger on what it was that lead to my reappraisal of their output. My early twenties were certainly witness to a widening of my musical taste. I started to meet people other than those who I’d been to school with and who were generally older and wiser than me. People like Sid Smith and Chris Taberham who introduced me to artists as varied as King Crimson, the Kinks, Miles Davis, Soft Machine and Philip Glass amongst many, many others. I don’t recall being sat down by someone and being told the errors of my ways regarding Zeppelin, or any particular Damascene conversion moment. I just woke up one day and they made sense. Over the past couple of years Jimmy Page has been working to produce what he considers to be the definitive version of each of their albums. Last week the first three self titled albums were re-released in several formats ranging from a single CD for about £10 up to a deluxe box set containing CDs, LPs, downloads, books & memorabilia for £105. Given that I had pretty much everything in various formats anyway and didn’t really fancy the bonus tracks I plumped for the basic single disc 180g vinyl versions of all three, which I picked up at JG Windows in Central Arcade. The packaging is great. The band have released everything in replicas of the original sleeves so III, for instance, has the cut outs and spinning wheel to play with as you chill out. The remasters themselves have had a bit of a mixed press with some bemoaning a lack of space and air in the delivery. I’ve yet to give them a good listen at decent volume so I’ll keep my powder dry on that one for the moment. But I guess you are always going to have some problems selling a new version to people who have grown up and lived with the original for so long. We’ll see. Which of these first three am I looking forward to hearing the most? 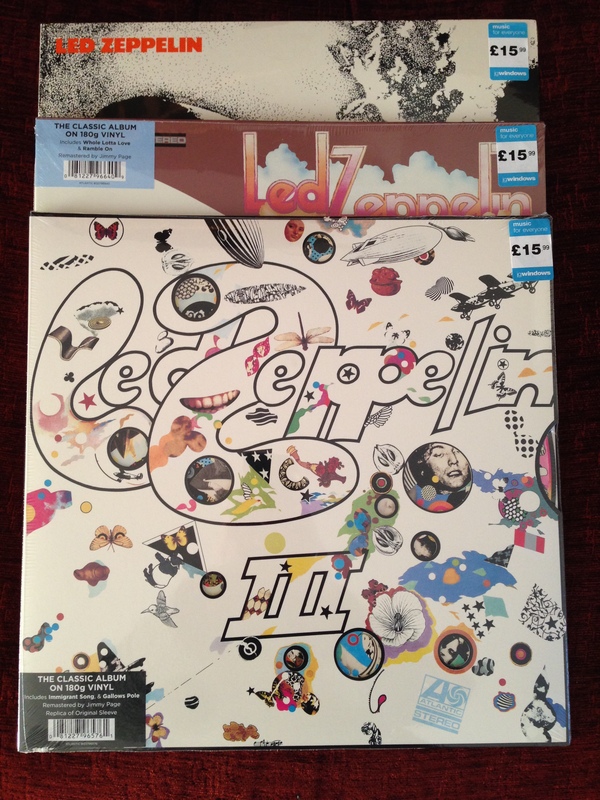 Well when I first got into Zeppelin it was the powerful rock of II which appealed the most. Later I mellowed into III but these days I have a soft spot for the debut album. Sure, it’s largely a bunch of covers and reworkings of blues standards but boy do they stamp their identity all over them. I’ll leave you with what I consider to be the standout track on that debut, Babe I’m Gonna Leave You.